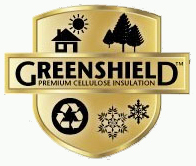 GREENSHIELD™ insulation is made by Carolina Fibers from post consumer recycled paper fiber. GREENSHIELD insulation is an excellent choice for high performance energy efficient installations, and will earn additional points in a green/sustainable home certification program like LEED®, Built Green, LLC® or NAHB for homes. Insulation is a critical component of any integrated building design. Your insulation choice drives energy performance, energy consumption, cost to heat & cool, and ultimately homeowner or occupant comfort. Your insulation choice may also affect you decision on achieving a GREEN certification. Cellulose insulation is the primary choice for loose fill attic installations. Cellulose forms a monolithic layer across the attic with a strong fiber matrix. This monolithic layer provides an excellent thermal barrier and as a result will provide excellent thermal performance. In addition to forming a strong thermal barrier, cellulose will maintain its thermal performance across a wide range of temperatures as compared to loose fill fiberglass products. Maintaining thermal performance across a wide temperature range helps reduce energy loss with temperature extremes, keeps the warm air within the building on cold months and keeps the hot outside air from penetrating the building in the hot summer months. This level of thermal performance reduces the cost to heat & cool the home; and provides a higher level of homeowner Comfort. In an existing home with loose fill fiberglass insulation, you can add an additional 3-4 inches of GREENSHIELD cellulose insulation. These additional inches will vastly improve energy performance, reduce the cost to heat & cool, and improve overall Comfort. Call for more information on a cellulose attic retrofit or a cellulose attic cap. Insulation contractors should call us for a complimentary GREENSHIELD comparison to other attic insulation options. With vertical walls systems, a critical insulation performance criterion is proper installation within each wall cavity to insure delivered or installed R-value. There is a distinction between the labeled R-value, what is printed on the package, and the R-value after installation or the installed R-value. To deliver the proper R-value, the insulation needs to be in contact with all surfaces within the wall cavity; and care needs to be taken around plumbing and electrical inserts to avoid any gaps or voids that could affect R-value performance. Being in contact with all surfaces means side-to-side contact with each stud; in contact with the back surface or outside wall covering; touching the top and bottom sill plate, and in contact with the backing of the interior wall surface or drywall. Any gaps or voids within the cavity will affect the installed R-value and ultimately reduce the overall performance of the insulation. The GREENSHIELD spray applied cavity fill installation system delivers the proper installed R-value. The spray applied cavity fill system completely fills the open cavity. This system easily fills behind wall outlets, electrical boxes and surrounds plumbing. Excess spray-in material is scrubbed clean and inline with the stud facing, which allows for contact with the interior surface or the drywall. This cellulose cavity fill installation system reduces gaps and voids, which reduces air infiltration. Reducing air infiltration reduce energy loss and eliminates drafts which improves energy efficiency and reduces the cost to heat & cool. The GREENSHIELD cavity fill system improves air quality, improves energy performance and improves homeowner Comfort.